I know people that literally go NUTS over IN-N-OUT BURGER. They’ll drive what seems to be 100’s of miles out of their way just for a burger and fries. 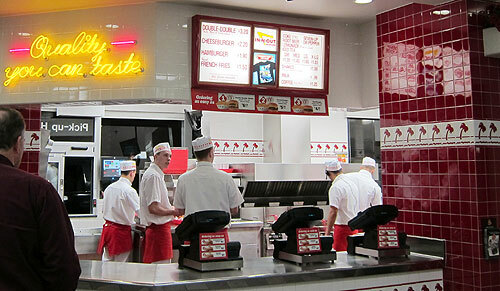 Now that there’s an IN-N-OUT BURGER down the street from my house, I thought I’d see what all the fuss is about. The wife and I ordered cheeseburgers (pictured) and a fry. The good thing I’d say is that the place is relatively cheap. For two cheeseburgers, an order of fries big enough for two and two sodas the cost was under $10. Very reasonable. Other burger joints might be upwards of $15 for that same selection. The fries at IN-N-OUT BURGER are thin. They’re not terribly flavorful either. In fact, the wife and I found ourselves shoving the fries to each other saying, “you can have the rest.” Not impressed. The cheeseburgers were decent. My meat was a bit undercooked. I liked how big the grilled onion slices were. The best part of the burgers were the buns without a doubt. At about $2.00 each, I’d say the cheeseburgers are a good value. Are they the best burgers ever, worth driving hundreds of miles for? Afraid not. IN-N-OUT BURGER is a good value. Probably a good place to take the family for cheap chomps. If I’m in the market for a burger though, I can easily find many places better which I’d be willing to pay a few bucks extra for. I remember when these guys came to Utah and i would see lines at the drive through longer longer then the lines at Walmart for black friday! I decided to wait for the hype to subside before i decided to eat their and when i finally did the food really wasn’t exactly the greatest. It wasn’t bad but it definitely wasn’t worth sitting in a car line for 2 hours for.